I’m not usually a fan of the term ‘pimp’ when applied to crafting, but it was the first thing that came to mind when I saw these cute little towel toppers. I have a huge collection of costume jewelry – much of it is stuff that I would never wear. But, in the right context, they could be useful. Well, here’s the context! If you don’t happen to have these pieces hanging out in some drawer, head to a thrift store or garage sale – or ask a neighbor or friend who has some hanging out in her drawer. They are pretty easy to come by. And, best thing is that they are in no way damaged by being used in this manner. Just unpin them to launder your towel topper then pin ’em back on when you’re ready. The red one would be cute for Christmas while the green one would work for any occasion. Tailor the colors and ‘jewels’ to suit yourself. These samples and the inspiration came from this blog. 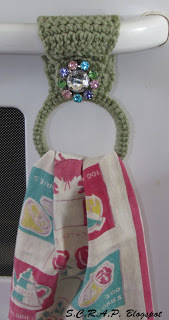 While you’re there, check out what she does with those plastic rings we get off milk cartons. Amazing! Use the ‘jewels’ instead of the buttons I used on these towels. 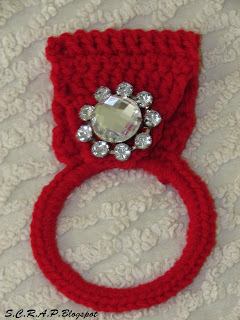 If you need a specific pattern to make your own towel toppers, just check at www.crochetpatterncentral.com . There are all kinds of free patterns out there.